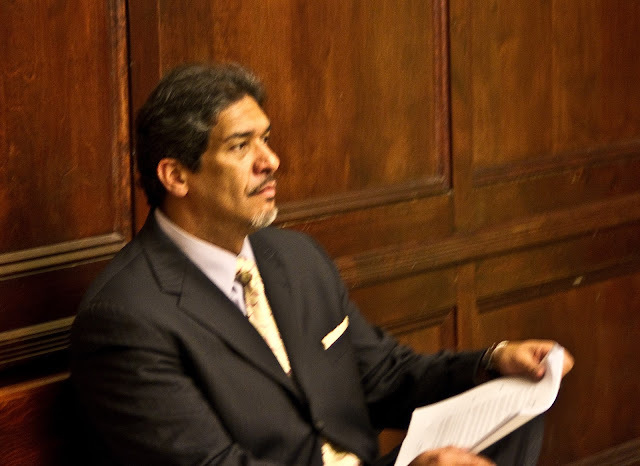 The verdict arrived in the Alicea discrimination lawsuit against the City and it's a whopper. The Hudson County jury of six women and two men awarded $440,000 to Alicea who was eventually replaced by the current Public Safety Director Jon Tooke. The City's record of winning or settling over 90% of its cases in recent years just took one on the chin. The verdict was divided into two parts. In the first part of the decision involving Mayor Dawn Zimmer, the jury said the mayor had not discriminated against Angel Alicea. In the second part of the decision against the City, the jury decided Angel Alicea had been discriminated against and made the award. The Jersey Journal reported the jury voted 7-1 Mayor Zimmer didn't discriminate against Angel Alicea and the mayor isn't liable. The jury then followed with another vote 6-2 the City had discriminated in a odd "compromise" verdict as some legal observers described it. The inconsistency seems to revolve around the part time status of the public safety position where Alicea made $27,000 while the replacement role acting full time paid $110,000. Talking Ed Note: The decision by the jury is already being described as inconsistent. Since the Public Safety Director reports to the mayor, she was in charge of his performance and accepted his resignation. The jury made the City responsible but not the mayor. The case alleging discrimination in a civil suit by former Public Safety Director Angel Alicea is now in the hands of the jury. MSV will have an update when a verdict is reached. In court testimony, Mayor Dawn Zimmer identified Alicea as the former municipal employee who received her emails in the 2011 FBI criminal complaint from former IT Manager Patrick Riccicardi. Ricciardi was sentenced to five years probation for his role in the Data Theft Conspiracy Ring. Former Public Safety Director Angel Alicea in a stock MSV photo back when he served the City. He's pending on a civil lawsuit against Hoboken being weighed by a Hudson County jury.